Cleo is Pet of the Week! You are here: Home / Pet Corner / Cleo is Pet of the Week! Cleo will come pattering (sorry—we couldn’t resist it) out from her little barge as soon as she senses the security of a person willing to be patient and kind. So often, pets get left at our shelter without knowing what the deal is and why they aren’t in their safe places anymore—if they had one. 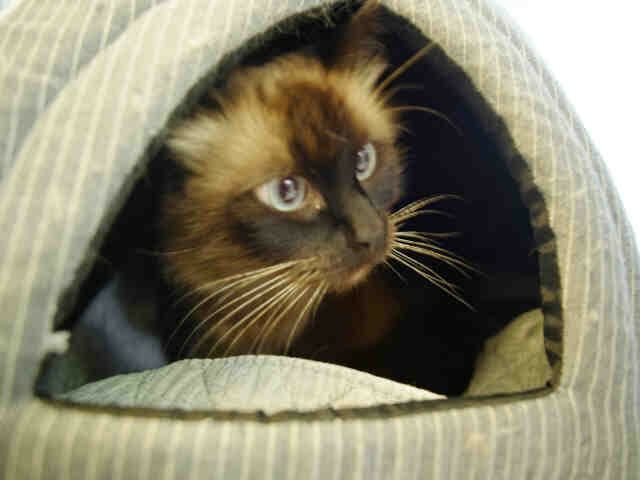 Cleo’s a royal seal-point Siamese who’s about 2 years old and has plenty of good years to share with the right people. Meet her at the Companion Animal Village at 7700 East Spring St., (562) 570-PETS. Ask for ID#A573245.